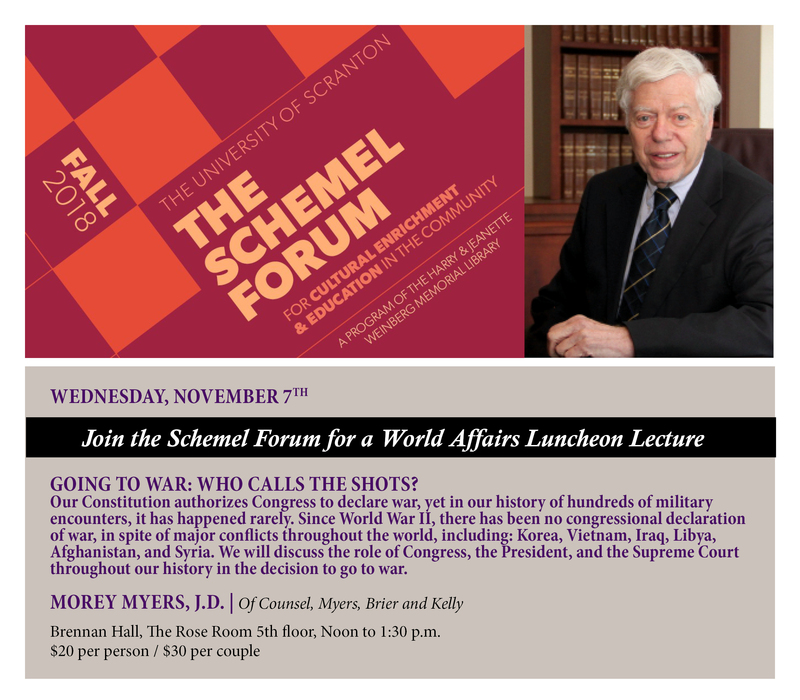 Take advantage of the opportunity to become college students for the first time or once again, through an innovative program offered by the Schemel Forum at The University of Scranton. University for a Day, scheduled for Saturday, October 2, allows participants to attend lectures that explore topics ranging from slavery and Confucian philosophy to university professors’ role in the community and books and argumentation. According to Sondra Myers, director of the Schemel Forum at The University of Scranton, the program provides an opportunity for attendees to come together to explore new topics and forge new relationships. “Participants develop friendships through the collaborative community of learning that these programs provide,” said Myers. Other programs planned are “’Our Peculiar Institution’: Slavery in the South” by Attorney Morey M. Myers; “Scaling the University’s Gates: The Professor in the Community” by Clement Price, professor of African American studies and founding director of the Institute on Ethnicity, Culture and the Modern Experience at Rutgers University, Newark, N.J.; and “Books and Argumentation: A Panel Discussion” featuring authors Christopher Hitchens and Jay Parini, and moderated by Morey Myers. “Books and Argumentation” is held in collaboration with the second annual Pages and Places Book Festival and will take place at the Scranton Cultural Center. Transportation to the center will be provided. The University for a Day program will run from 8:45 a.m. to 5 p.m. in the Patrick and Margaret DeNaples Center on The University of Scranton’s campus. Seating is limited and reservations are required to attend. The participation fee is $25 for non-Schemel Forum members. To register, contact Kym Balthazar Fetsko, events coordinator, at (570) 941-7816 or fetskok2@scranton.edu. University for a Day is made possible through the support of the Wachovia Regional Foundation and the Scranton Area Foundation.